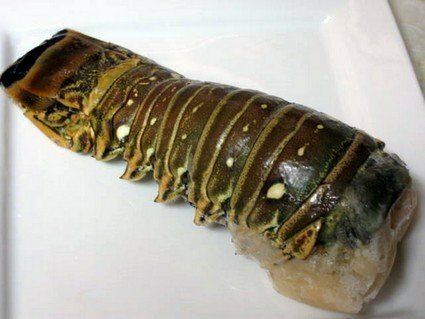 If you are new to cooking lobster tails I would suggest you pick a cooking method you are comfortable with, no need to experiment on such expensive seafood. I also steered my customers who where cooking lobster tails for the first time to steaming. Not quite as colorful as baking, broiling or grilling, but steaming lobster tails is pretty much fool proof, as to getting it cooked right. Plus I think steaming brings out the true flavor in a lobster tail. Just serve it with melted butter and fresh lemon. If you haven't bought your tails yet, you might want to read my frozen lobster tails buying guide or read more about the spiny lobster, if you are shopping for lobster tails here are some places you can buy lobsters online. If you are going to be broiling, steaming or grilling your tails, I suggest that you butterfly them first. Whether you butterfly your tail or cook them in the shell, to prevent them from curling up while cooking, run a skewer lengthwise through the center of the lobster tail meat. If you will be using wooden skewers and baking, broiling or grilling make sure to soak them in water first for about 30 minutes to prevent burning the skewer. If you are going to be using just the meat in a recipe that needs cooked lobster meat. After cooking them you will need to place them in an ice water bath to stop the cooking. Make sure to drain well, cover them in cellophane wrap or an air tight container and keep refrigerated. Cooked lobster meat will hold for 1 or 2 days in the refrigerator. Also remember that the tails will continue to cook a little after you have removed them from the heat source. In a large pot add enough water to cover how many tails you are boiling, add 1 tsp. of salt per quart of water you have. Bring to a boil, drop the thawed lobster tails in, after the water returns to a boil reduce the heat and begin timing. How Long to Boil Lobster Tails? The rule of thumb is 1 minute per oz of the tail, so a 4-6oz lobster tail will be cooked for 4 to 6 minutes. Steaming can be done over a large pot with a steamer basket or in a steamer/rice cooker appliance. You can butterfly the tail or split them in half if you have a larger tail. If using a pot to steam bring the water to a boil place lobster in the basket and steam for about 1 minute per oz of lobster. Season your tail with salt and spread butter over it. I really like the electric food steamer , it's fast and easy and almost fool proof by using the instruction booklet that comes with them. You can just put the specified amount of water in it, cover and cook. Butterfly the tail, brush with butter or olive oil, place tails in a dish, add about 1 cup of water to the dish and in a preheated 400 degree oven bake a 6 to 8oz lobster tail for 8 to 10 minutes. Your baking time will vary according to size of tail, the temperature of the meat ( room temp or just out of the refrigerator) and the heating of your oven. Lobster tails can dry out quickly so the water helps put a little moisture in the oven. If your still are not comfortable with baking them like this. Cover your pan with aluminum foil and the moisture will stay within the pan. This is called steam baking. 12-14 oz tail for 14-16 minutes. After butterflying your lobster tail. Fill your broiling pan with a 1/2" of water. Preheat the pan in the oven till the water is hot this helps keep the lobster moist while broiling. Remember not all oven broilers are the same. Some produce more heat while others will not. The hard part is finding the right distance to place the broiling pan away from the heating element. Larger tails, say 8 oz or larger will need to be placed farther away from the heat. For a 8 to 9 oz tail the rule of thumb is somewhere between 8 to 9 inches away from the heat. Cooking time for an 8 to 9oz tail it would likely be around 10 to 12 minutes. To avoid baking the tails when broiling keep your oven door ajar, with the door ajar it makes it easy for you to watch your tail cook in case you need to make any adjustments. Place the tail or tails on a broiling pan, brush with melted butter. Keep basting with butter as needed until your lobster tail is opaque. Once again I like to butterfly the tail, the size of the tail and the grills heat will determine your cooking time. Over a medium high heat place the tail meat side down first, this will get you some nice grill marks and a little browning of the meat. A 8 to 9 oz tail you would grill for about 4 to 5 minutes and then turn to finish cooking, say another 5 to 6 minutes, basting with butter.